Please use our online form to schedule an in-home evaluation. St. Grace Hospice provides professional services whether at home or in a related facility where the patient resides. Hospice is a healthcare service designed for the special needs of an individual facing a life-limiting illness who chooses not to seek aggressive treatment for their condition. 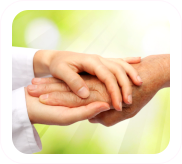 Support is provided to the patient, the patient’s loved ones, as well as the patient’s caregivers. Our services are available 24 hours a day, 7 days a week. We’re there for You! It’s never too soon to ask for help. Call us to schedule someone to come out for an in-home evaluation to determine which hospice programs and services would be appropriate. Turning to Hospice is not about giving up; it’s about giving yourself and your loved ones a compassionate alternative to conventional medical care.